Magnum keyboardist Mark Stanway has left the band after 36 years. He says in a statement: “Due to irrevocable circumstances, I am deeply saddened to announce that I have made one of the most difficult decisions in my life – I have officially left Magnum. “I apologise to anyone who was maybe hoping to see me personally over the next few days, but sadly I will not be there. However, I should like it known, that, I am and will remain extremely proud to have been a small part of it all for the past 36 years or so and wish the band and organisation all the best for the future. The Magnum camp have yet to make an official statement on Stanway’s departure, but bassist Al Barrow checked in to assure fans that the last three dates this weekend in Dublin, Wolverhampton and Edinburgh will go ahead as planned. 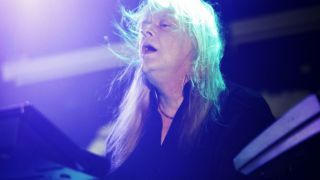 Stanway joined Magnum in 1982 for their third album Chase The Dragon and made an immediate impact, with his keyboard work on the band’s signature track Sacred Hour helping it to become a crowd favourite.